Adventures in CSA (week 7): Bok choi! I love that name: bok choi! It sounds like it should be the name of a Vulcan..or something a Klingon would say. It’s clearly a very Star Trek-friendly vegetable. I also happen to like how bok choi tastes, although I’m not used to getting 2lbs of it at a time. Really, this may be a bit more than we can handle. We actually went through the fridge last night and found that there was definitely some spoilage in things we never got to (eggplant & scallions, mostly). It’s really hard keeping up with a 1/2 bushel box of vegetables *every* week when you don’t have veggies as your primary food. Still, we’re determined to keep on keepin’ on. 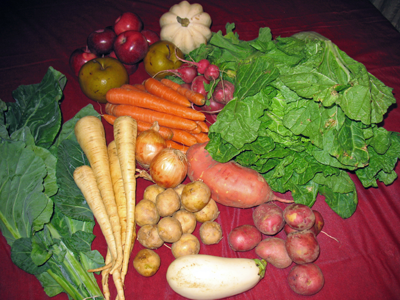 Next week is actually the last week of this particular CSA subscription; the next one starts up in the first week of November and will be delivered every other Tuesday. I suspect that may make it a little tougher for us to plan things out, but we’ll manage as best as we can. My prediction on this box is that it will definitely be worth more than $20 in grocery store value; it was PACKED with a ridiculous amount of fruit and veggies this week. More than a week's worth, for sure! You could try the radish dip I made. It’s simple, radishes, garlic, cream cheese and sour cream, blend in food processor. It’s still a little bitter, but the cream cheese and sour cream help balance it a little.